This is like the 4th time I watched this movie since I bought it. I don't know why I enjoy this one so much... but I do think Nicole Kidman did a really good job in it. Then again at the same time... even though I usually enjoy his work... I wasn't too impressed with Will Ferrell. I think part of my had a problem with the fact that it wasn't really a movie made from the series as most of these movies are. But a movie about remaking the series. I think I would have personally preferred a straight movie version of the series. Even with that said... I obviously still enjoyed this movie quite a bit... even if I am not 100% sure why. I guess it is just fun to watch... no more and no less. Note to Jimmy: This is a recycled review.. but with more info... you can just switch the links for this one. Another one I enjoyed quite a bit. It is a lot of fun watching the character of Adam experiencing the world for the first time at 35. An interesting... and at times... funny story. 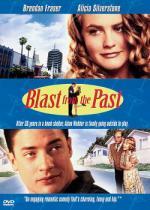 I liked both Brendan Fraser and Alicia Silverstone in this one. I am not what you would consider a huge fan of Alicia Silverstone... but I really liked her in this movie. There was just something about her in it. She was spot on the character in this one. If you never checked out Blast from the Past... I definitely recommend it. You are cordially invited to fall in love with one of the funniest romantic comedies of the year! It's 1985 and Robbie Hart (Adam Sandler, Happy Gilmore, Billy Madison) is the ultimate master of ceremonies... until he is left at the altar at his own wedding. Devastated, he becomes a newlywed's worst nightmare — an entertainer who can do nothing but destroy other people's weddings. It's not until he meets a warm-hearted waitress named Julia (Drew Barrymore, Scream), that he starts to pick up the pieces of his heart. The only problem is Julia's about to have a wedding of her own and unless Robbie can pull off the performance of a lifetime, the girl of his dreams will be gone forever. OK... what was I thinking watching this movie today? Not that this is a bad movie per say... because it definitely does have some laughs in it. And Drew Barrymore looked cute as can be in this one. But there is just way too much music for my taste in this one. 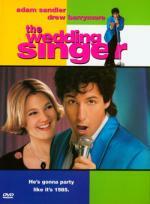 Who would have guessed with a title like The Wedding Singer... right? So yes... that was a big damper for me. I did get a kick out of all the '80s references and style/memorabilia. I was a teen back then... so there was a lots of nostalgic qualities for me here. Well... that is 10 movies (3 Thurs. - 3 Fri. - 2 Sat. - 2 Sun.) for this marathon. So I think I will give the movies a break and end it here so I can concentrate on the Valentine TV Episodes today. I did get a kick out of all the '80s references and style/memorabilia. I was a teen back then... so there was a lots of nostalgic qualities for me here. I agree with Jimmy. The movie just wouldn't have worked as well without the music. Oh I am sure it wouldn't have worked without the music. I wasn't trying to say that. I just am not a fan of music (any music).